These are really, really garlicky. If you don’t like garlic that much, you definitely won’t want to add as much as I did. More of a garlic taste means less of a whole grain taste, so I’m all for adding copious amounts of the stuff. Don’t skip the garlic butter on top! They wouldn’t be nearly as good without it. It’s only 2 tablespoons spread out over 8 biscuits, so it’s not that much. And really, these are meant to be eaten still warm. Cold biscuits just aren’t the same. If you don’t have buttermilk, just add 1 tablespoon of lemon juice or vinegar to a 1 cup measuring cup. Fill with milk, and in 10 minutes, you’ll have a perfectly good buttermilk substitute. It’s not as good as the real stuff, but it’s pretty close. Preheat the oven to 450 °F / 230 °C. In a medium bowl combine the flour, baking powder, salt and garlic powder. Cut the butter into the flour mixture until coarse crumbs are formed. You can use a fork or two knives, but I just work very quickly with my hands. How much buttermilk you need will vary. I normally use 3/4 cup. You want the dough to come together, but you don’t want it too wet and sticky. Be careful not to overmix! 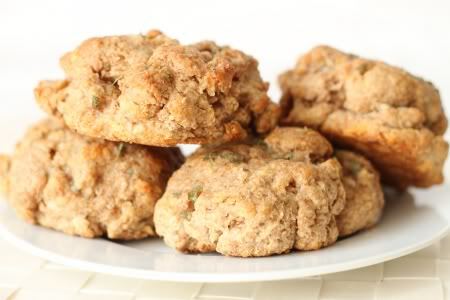 Drop the biscuits on a Silpat, parchment paper or a lightly greased baking sheet. I like to flatten mine a little. I normally make 8 and they’re a decent size. Bake for 10 – 14 minutes or until lightly browned. They will take more or less time depending on how big you make them. Meanwhile, prepare the garlic butter by melting the butter and then adding the other ingredients. Right after you take the biscuits out, brush the garlic mix over the biscuits. Or just dip them in the butter. Eat them up quickly while they’re still warm! You will be sad and perhaps cry if you don’t. German bakers: With the fan, bake at 220°C for 8 – 12 minutes. I haven’t tried these with German baking powder but I imagine that they’d work. I’ll make these again at some point with the German stuff and update the post. 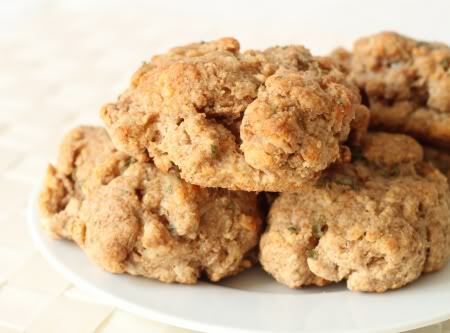 10 comments on “100% Whole Grain Cheddar Garlic Biscuits” — Add one! These sound really good, but I’m confused about one thing. The ingredient list calls for garlic powder, but in step 2 of the directions, it says to add garlic salt. Which is correct? Thanks for pointing that out, Cori! I’ve changed it to say garlic powder. I hope you enjoy the biscuits! I made them yesterday, for Father’s Day. They were amazing! I couldn’t stop eating them. I knew I was going to love the garlic butter, so I scaled that part of the recipe up to use a full stick of butter. I didn’t put the whole scaled up amount of lemon juice in it and I had trouble getting the smaller amount to mix in, but it was delicious anyway. I would have been disappointed if I’d have made less of the garlic butter and had run out of it before I finished the biscuits. This way I have more garlic butter to use on other food. 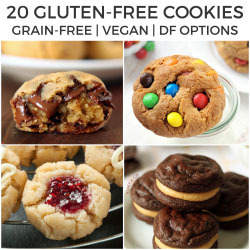 :) Thank you for posting this recipe! Oops, I didn’t see that I could rate this recipe until after I’d hit submit. This is definitely a 5 heart recipe for me! I’m so happy that you enjoyed the biscuits, Cori! Your idea of using more garlic butter sounds great. :) I’m with you there. More garlic butter = better! Thanks so much for the feedback. I really appreciate it! Oh and I hope the fathers enjoyed the biscuits, too. Hope you all had a great Father’s Day!